We remember someone once telling us that they always made money buying beer stocks ahead of Memorial Day as consumption always picks up in the summer. Along that line of thinking, we wondered whether or not there were any stocks or groups which consistently do well during this time of year. 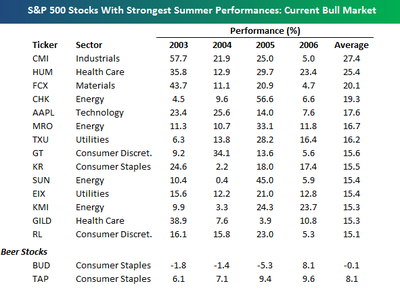 To that end, we analyzed the performance of current S&P 500 members from Memorial Day through Labor Day to see if there were any that were up during each period. Not only are there 76 different companies that have been up over each of the last four summers, but there are also 37 that have had double digit returns! For the sake of space, below we have listed the fourteen companies with average returns of greater than 15% over the last four years. On the negative side of things, there is only one current S&P 500 company (FHN) that has declined in each of the last four summers. As for the beer theory, the results here are mixed. TAP has been up over each of the past four summers, while BUD has been up just once.